Even though I haven’t seen my friend Kelly in over 28 years, I still feel like securing a large piece of electrical tape over my mouth every time I think about her. Kelly was one of the first friends I made in Ms. Lefever’s kindergarten class after moving to the United States, and the first to invite me to her home for a playdate. While playing with her impressive collection of stuffed animals, she assigned two of the larger stuffed raccoons as adoptive parents of a smaller koala bear. Eager to learn a new English word, I asked her to explain what “adoptive” meant. “It’s when a baby grows in one lady’s stomach and then she lets another lady be the mom. I’m adopted too,” Kelly explained. I try to remember my past ignorance and Kelly’s grace when my own daughter is asked these kinds of questions. And just like my childhood friend, Cal answers from a place of confidence when others ask where her “real” father is or how it feels to have a man “pop up” in her life at the age of seven to be her dad. If Harv is around when people try to make sense of how our family came to be, Cal waves in his direction and says with ease, “That’s my real dad. He’s my only dad. He takes care of me and he loves me.” One time, I think I heard her add something about how she likes that her dad laughs at all of her mom’s jokes no matter what, but I just brushed it off. All of my jokes are funny. I must have misunderstood her. It doesn’t seem to bother her that people poke at the validity of the bond she shares with her father. She recognizes that an absence of understanding in others doesn’t detract from the love she receives and gives to the man who will love her always, in all ways. I’m tempted to write about the answers I’ve given in the past when people ask me when I’m going to have another baby so I can give my husband a “real” child of his own, but then it would be apparent that I don’t keep my own childhood ignorance in mind all of the time. Also, who needs that kind of profanity in a blog post about family love and commitment? Let’s just say I’ve learned to modulate the shrillness in my voice while I say as evenly as I can that Harv already has a child of his own and that he’s an amazing father to our daughter. I understand now that where we start is our biology and the road we travel is our biography. 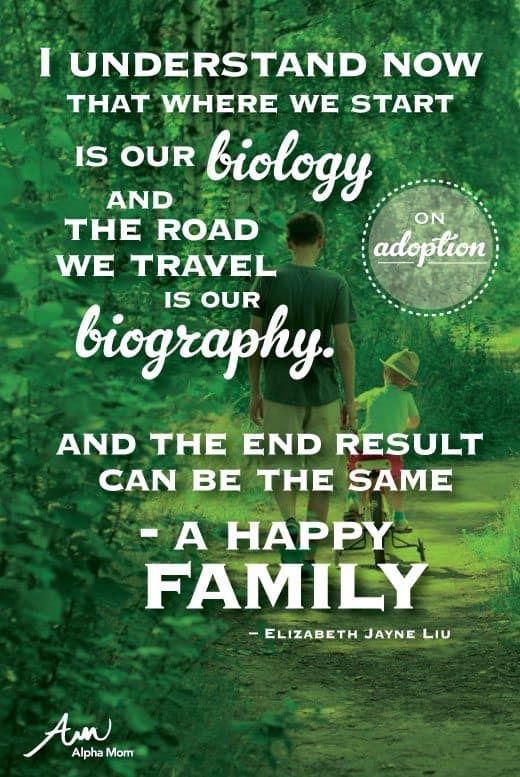 And whether we gain the parents we have through biology or biography, the end result can be the same- a happy family. When I think of all the Kellys and Cals, I feel a deep sense of sadness that some people will never accept this concept. To these people, a “real” family starts in only one way. Any other permutation is seen as a makeshift solution, a model plastered together with imperfect seams and ill-fitting pieces. I guess they haven’t been lucky enough to experience love by choice, and not by chance. Happy Father’s Day, Harv. Both Cal and I are lucky as hell to have you in our biography. Elizabeth started her blog, Flourish in Progress, on her thirtieth birthday to chronicle a yearlong shopping ban. Surprisingly, she survived, and now records a series of weekly challenges called Monday Dares. She fails a lot. Elizabeth writes candidly about her former addictions, love of four-letter words, and her affinity for all things rap. She lives in Los Angeles with her husband, whom she married after dating for just eighteen days, her 13-year-old daughter, and her complete collection of Yo! MTV Raps Trading Cards. Connect with Elizabeth on The Huffington Post, Facebook, and Instagram (@flourishinprogress). Thank you!!!!! ‘Our’ oldest (she’s 9) is not biologically ‘his’. But boy oh boy don’t tell either one of them that! That is her daddy. One of his brother even tried to get Lu to call hubs step dad, and he got the talking to of his life 🙂 also, Cal sounds like the most awesome child ever so you are doing a great job! I love this so much. Your husbands sounds like an amazing man. My personal belief (and maybe part of this come from my own experiences as well) is that a strong bond between father and daughter really makes a profound difference in what kind of woman that child grows up to be. “I understand now that where we start is our biology and the road we travel is our biography.” That line totally blew me away. Lovely piece. My sister is a single mom and her daughter is just now starting to ask questions about her absent dad. I hope she’s able to find a man like Harv who will love her like his own someday. Cal was so unfamiliar with the concept of a father, that when she started talking, she called my brother “daddy.” That was a hard one to explain, and it was even tougher later on when she asked how long she would have to wait to have her own dad. I’ve heard lots of women say that there are no “good men” left, but I don’t think that’s true at all. I hope so much that your sister finds a man who loves her and her daughter in the way that they deserve. Thank you, so much, for your kind sentiments. They truly touched my heart. I just want to hug you and EJL, right now. Her grace has stayed with me. I want to be like her when I grow up. I think it’s pretty awesome when kids (or anyone, really) approach adoption with a desire to understand more, and even awesomer (word? not a word?) when the adopted person already comes from a place of understanding. I’ve got tons of friends who’ve adopted, and I find myself saying stupid stuff ALL THE TIME. So I really appreciate it when people, like you, take the time to educate awkward friends like me. As for Cal, that girl is pretty incredible. It’s baller of you to admit that you make slip-ups. And BALLER (all caps is next level baller) to want to be educated. Thanks for the love, Dawn! Oh man, I wish I hadn’t put on liquid eyeliner right before reading this. Your dad sounds like an incredible man. Thank you for sharing your experience with me. I know that one day, when Cal is a grown-up, she will be able to say the same things about her dad. My husband grew up in a loving home where he was “taught” at an early age what a family who loves and supports each other looks like. I (partly) credit his upbringing for his amazing skills as a dad. It’s pretty awesome that your aunt and uncle helped perpetuate a cycle of good, so that you would know what a solid family looks like, and in turn, you could create the same for the family you have now. What a gorgeous post! So much love. My aunt was adopted by my grandparents when she was 5, and I’m so lucky that we have her in our family.